Pioneer DDJ WeGO - Drop some bass and beats in the comfort of your own home. When the music industry switched from analog to digital, the new age of music ﬁrst showed up with lots of synthesizers, drum machines and loops. We have progressed to a time where Electronic Dance Music (EDM) is now mainstream, with devices like the Macbook Air able to make a serious claim at being an actual music instrument. Of course, having a laptop is merely the ﬁrst piece of the puzzle.The next piece comes in the form of devices like the Pioneer DDJ WeGO controller, which bring hardware back into the software-driven EDM scene. The DDJ WeGO is a basic DJ set which has four virtual decks and two actual turntables, the latter of which lights up and has all the fancy bells and whistles. In layman’s terms, the DDJ WeGO is capable of playing four tracks simultaneously, with two able to be manipulated via the turntables at any given time. Knobs for adjusting bass, mids and treble for the two turntables are also present. Of course no DJ console would be complete without sliders for tempo and cross faders, and the WeGO has them both. Rounding off the features, the set also comes with four buttons which serve double duty for cues and loops, as well as a selection of buttons to control effects. In order to function, the DDJ WeGO requires a connection to a computer or notebook via USB. Once installed, we tested the controller with Virtual DJ. In use, the turntables functioned well; touching the top surface will pause the track until contact is severed, while moving the tables resulted in scratching. However, the fact that all loops played on the deck stopped when using the turntable was slightly off-putting. While the cross fader functioned as one would expect, we would have preferred the slider to be slightly more damped. The tempo sliders did not have a similar problem, but only come with visual markings. It would have been nice to have a grooved slider to demarcate tempo switches and provide tactile feedback. Though the options for loops and cues are numerous thanks to the four buttons available, we found it hard to switch between them on the ﬂy. Pioneer prices the DDJ WeGO at $399. The device doesn’t only look visually appealing, but the companion software helps out greatly by displaying vital data such as BPM and song keys, making it attractive for beginners. 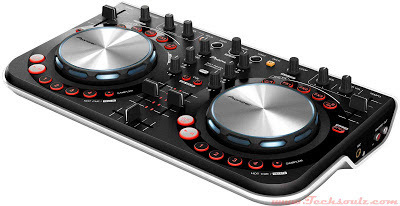 The provision of four decks and two turntables along with tempo sliders and a cross fader also make this ideal for enthusiasts and people with intermediate DJ skills. However, for a similar monetary outlay you can get yourself a tablet, complete with DJ apps.